It started as a half-baked idea more than 30 years ago — a Smiley Cookie as the vehicle to communicate the ethos of a restaurant — Eat’n Park, the Place for Smiles. Soon our cookie became not just the icon of a delightful family dining experience, but a symbol of commitment to community involvement and support; indeed, the heart of the company. 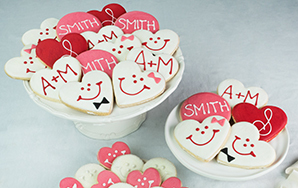 Our smile grew even bigger with the introduction of Smileycookie.com. 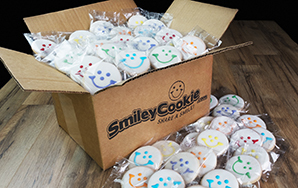 Smileycookie.com is an online cookie delivery company offering fresh-baked, hand-iced Smiley Cookies delivered all over the country — fast and fresh. 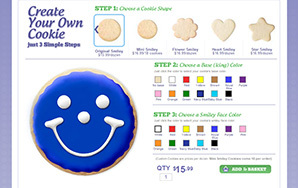 Smileycookie.com makes it easy for you to share a smile with anyone, anywhere, for any occasion. Our famous cookies take the celebratory shape of hearts, shamrocks, bunnies, jack-o-lanterns and more for holidays and special occasions, and are available in virtually any color combination to sweeten the deal. You can also enjoy them individually-wrapped and in bulk quantities for everything from corporate events to class parties. No order is too big or too small. Customers can even order customized cookies to match wedding colors, sports teams, school colors and more! Our cookies can be delivered fresh nearly anywhere to as many addresses as you choose.